Eating disorders are serious mental health disorders with severe and life threatening medical and psychological consequences if untreated. They are not issues of willpower or methods of dieting but potentially deadly diseases that require professional medical and therapeutic treatment and support. 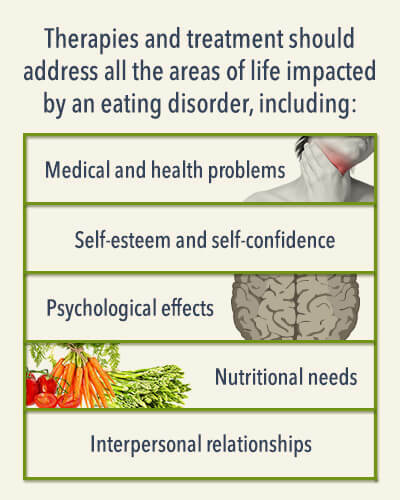 Clients are encouraged to seek an eating disorder treatment program that is well-rounded in nature at the earliest signs of a disorder. Without treatment, eating disorders can be fatal. They can lead to a range of chronic and acute disorders that diminish quality of life and that can be life-threatening in some cases. Therapy, support from peers and staff, family support, and in some cases, certain medications can all contribute to the client’s ability to function without resorting to disordered eating habits, to get to and maintain a healthy weight, and to create a new life in recovery. Anorexia nervosa has been identified as the most lethal mental health disorder. It is defined by a fear of weight gain, and those who struggle with the disorder may believe they are fat when they are underweight, exhibit an extreme distaste for anyone who is overweight, and significantly limit their caloric intake to the point of starvation. Extreme limitation of calories can quickly result in malnutrition, chronic fatigue, mood swings, and the failure of organs that depend upon certain nutrients to function. If untreated, the disorder can be deadly; in fact, people living with the disorder have a six-fold increased chance of death over the general population. Bulimia nervosa is a disorder characterized by binge eating followed by feelings of a loss of control and an attempt to regain that control through quickly ridding the body of the unwanted calories. People living with bulimia may attempt to purge calories and prevent weight gain caused by binge eating through such means as self-induced vomiting, use of laxatives, excessive exercise, or a combination of behaviors. 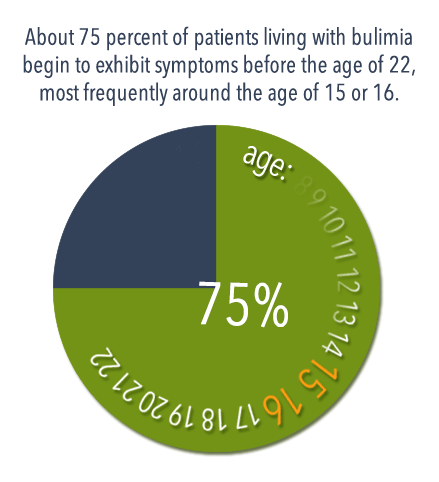 Bulimia is cyclical pattern of behavior. Some people living with the disorder may binge and purge daily while others may only do so a few times each week. Additionally, some people live with both anorexia and bulimia. They significantly limit their intake of calories for a period of time then take part in a binge session, eating a large amount of food, and then take measures to attempt to stop the absorption of those calories. Unlike people living with only anorexia, however, those struggling with bulimia may be at a normal weight for their height, underweight, or overweight. Additionally, people living with bulimia may have damaged tooth enamel, swollen glands, an inflamed throat, and reflux and/or dehydration. Binge eating disorder (BED) is the most commonly diagnosed eating disorder in the country and is defined by eating large quantities of food ” as much as 5,000-15,000 calories ” in a single sitting, then experiencing feelings of guilt and shame as a result. Binge sessions may occur after a period of stringent caloric restriction or dieting ,and they are often characterized by feelings of a loss of control. Those who struggle with binge eating are often overweight or obese and, as a result, are likely to struggle with medical problems such as heart disease, some cancers, high blood pressure, gallbladder disease, high levels of “bad”cholesterol, and/or type II diabetes. People who struggle with binge eating may also be living with another eating disorder or display other disordered eating habits. When a person’s unique combination of disordered eating habits does not add up to bulimia or anorexia, the diagnosis was “Eating Disorder Not Otherwise Specified”(EDNOS) until the Diagnostic and Statistical Manual of Mental Disorders (DSM-5) was updated. Currently, EDNOS is not a valid diagnosis. Rather, the term “Other Specified Feeding or Eating Disorder”(OSFED) is used to diagnose those who are living with a feeding or eating disorder that is intrusive in their lives emotionally and/or physically, causing distress or impairment, but does not fit the diagnostic criteria of anorexia or bulimia. In some cases, the person’s experience may be similar in nature to that of someone living with anorexia or bulimia but vary just enough to be outside the diagnostic parameters for those disorders. Atypical anorexia nervosa: Those who meet all the criteria for anorexia but who are maintaining a normal weight are diagnosed with OSFED. Bulimia nervosa: Those who purge regularly after eating but engage in the practice less frequently than twice a week, or who have been purging three or more times a week for less than three months will be diagnosed with OSFED rather than bulimia. 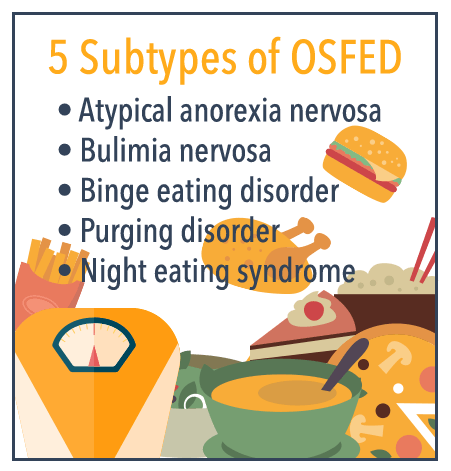 Binge eating disorder: People who engage in binge eating sessions, ingesting large amounts of food but who not do not feel out of control during or after the experience may be diagnosed with OSFED. Purging disorder: Those who do not binge before purging (e.g., using laxatives or enemas inappropriately or inducing vomiting) may find that their diagnosis falls into this category. Night eating syndrome: Eating after waking in the middle of the night or eating large amounts of food before bed are characteristic of this diagnosis. Additionally, other disordered eating behaviors that have been reported by patients seeking treatment that may be classified as an OSFED include exercise addiction (counting calories and obsessively exercising to ensure that more calories are burned than ingested to the point of exhaustion and despite illness or injury) and orthorexia (an unhealthy commitment to “healthy”eating that ultimately overly restricts intake of necessary nutrients or calories), among others. What Are the Best Options for Treating Bulimia and Anorexia? The American Psychological Association (APA) supports a range of therapeutic treatment options for people who are living with bulimia and/or anorexia. Because the driving forces behind these disorders (e.g., poor body image, low self-esteem, depression, anxiety, and peer pressure) are often just as important as the manifestation of the disorder in terms of the direction of treatment, the focus of therapies for both conditions may be similar though the structure may be different. In past years, treatment professionals have removed family from the equation when helping someone to learn how to manage anorexic behaviors, especially in the case of young people and their parents. In many cases, parental influence and expectations play a role in the young person’s development of anorexia, thus it was thought that by removing that influence the person in treatment would have a greater chance at making progress in recovery. Today, however, most treatment options emphasize family support and recognize it to be one of the most important factors in a person’s ability to learn how to manage eating behaviors. One research-based, short-term treatment for anorexia is called the Maudsley approach. Essentially a family-based treatment, family members, the person living with anorexia, and therapists all get together for a picnic meal in one of the early sessions. The goal is to educate therapists on eating habits and rituals in the family and family members’ attitudes toward eating while giving therapists the opportunity to help family members better understand how they can empower their loved one to eat more healthfully. In following sessions, family members have the chance to discuss what they have tried in the past in terms of helping their loved one to engage in healthy eating behaviors at mealtime ” what has worked and what hasn’t. This treatment approach also empowers the person’s sense of independence in self-management of eating while learning how to manage stressors in life that may contribute to the urge to limit caloric intake. Two types of psychotherapy are research-based and demonstrated to be effective in the treatment of bulimia: Cognitive Behavioral Therapy (CBT) and interpersonal therapy. Cognitive Behavioral Therapy assists the person in recovery in identifying all the unrealistic and negative self-expectations that may be triggering the urge to binge and then purge. Once identified, people in recovery can begin to make changes in their lives that will make it easier to avoid bingeing and purging. Interpersonal therapy assists people in recovery in working on the quality of their relationships with other people. With a shift toward more realistic expectations of what a relationship can and should be and improved communication skills, it may be possible to have stronger relationships that are less stressful, which in turn make it easier to avoid engaging in disordered eating habits. Where Can People Go for Binge Eating Treatment? Both inpatient and outpatient treatment options may be appropriate for the treatment of BED. Prospective clients are encouraged to talk to potential treatment centers in advance to learn more about the specific treatment options provided by each program and to determine which style and type of treatment will best suit their needs. 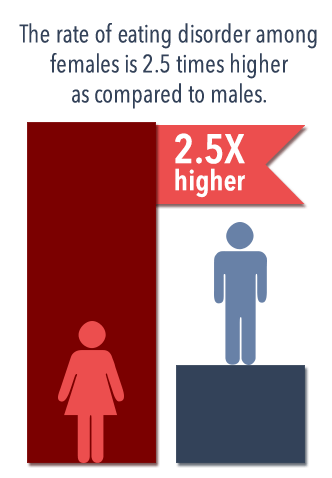 People of all genders and ages may struggle with eating disorders, however, the rate of eating disorders among females is 2.5 times higher as compared to males. The first signs of an eating disorder are most likely to appear during the teen years or early adulthood but could begin at any time including during childhood, midlife, or older adulthood. According to a report published in the journal JAMA Psychiatry that analyzed 36 different studies on mortality rates and eating disorders, it was discovered that, each year, the United States loses 5.1 people per 1,000 people living with anorexia, 1.7 people per 1,000 people living with bulimia, and 3.3 people per 1,000 patients diagnosed with EDNOS. Additionally, one in five deaths caused by anorexia were suicides. Though anorexia can occur in anyone, an estimated 85-90 percent of people living with the disorder are female. Though some people who have been living with anorexia and its physical effects for years may require inpatient care initially in order to stabilize early in treatment, outpatient care may be intensive enough to help up to two-thirds of patients to recover from anorexia and learn how to eat healthfully. Personal therapy, especially Cognitive Behavioral Therapy, has proven to be effective in the treatment of anorexia, but family-based therapies have also been demonstrated to play a critical role in helping someone to stabilize in recovery, according to a study published in the Archives of General Psychiatry. Though bulimia can occur in all populations, the disorder most commonly occurs in young white females: an estimated 1-2 percent of American girls are living with bulimia nervosa. An estimated 85-90 percent of people diagnosed with the disorder are female. About 75 percent of patients living with the disorder begin to exhibit symptoms before the age of 22, most frequently around the age of 15 or 16. Purging, the behavior that separates bulimia from binge eating, can occur in a number of different ways and doesn’t not always necessarily indicate self-induced vomiting. Over-use of laxatives, enemas, diuretic pills, and exercise to attempt to rid oneself of unwanted calories are all behaviors that may qualify someone for a bulimia diagnosis. An estimated two-thirds of people living with binge eating disorder are obese. Binge eating contributes to the development of obesity, which in turn can trigger a host of chronic health disorders, according to the US Department of Health and Human Services (HHS). Binge eating disorder is the most commonly diagnosed eating disorder, and an estimated 3 percent of Americans are living with the problem. 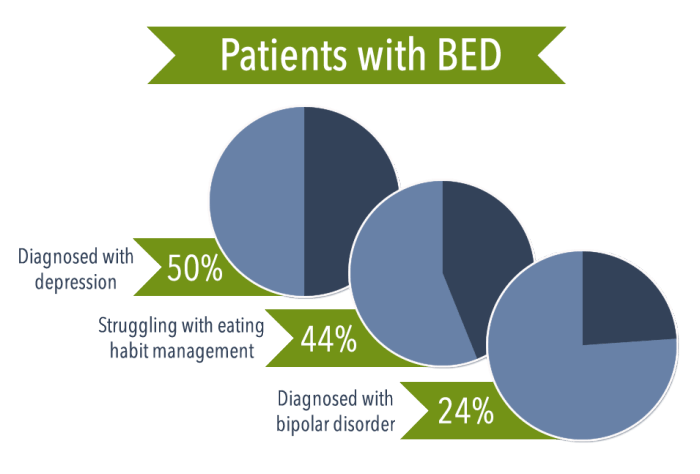 Additionally, about 50 percent of patients with BED are also diagnosed with depression, 24 percent are diagnosed with bipolar disorder, and 44 percent self-report struggling with eating habit management. Cortisol released during the stress response and the corresponding storage of fat in the abdominal area are increased issues for those living with BED and obesity as compared to the general public, according to a study published in the journal Appetite. Stress can also be a trigger for binge eating. Binge eating has been linked to increased rates of suicidal thoughts and behaviors, especially if the person with BED struggles with feelings of low self-worth and/or feels lacking. People living with binge eating disorder very often also struggle with disrupted sleep patterns, including difficulty falling asleep, waking at night to eat, and struggling to go back to sleep. The National Institute of Diabetes and Digestive and Kidney Diseases reports that people living with binge eating disorder are at higher risk of developing such health problems as headaches, joint and muscle pain, sleep apnea, digestive problems, high blood pressure, osteoarthritis, kidney disease, heart disease, stroke, diabetes, certain cancers, and fatty liver disease. They also experience difficulty in getting or maintaining a healthy pregnancy. Why Are Eating Disorders Bad for the Heart? How Do Eating Disorders Cause Osteoporosis? What Effect Do Eating Disorders Have on the Kidneys? Do Individuals with Eating Disorders Require Medical Attention? What Recovery Skills Do Eating Disorder Treatment Programs Teach? How Are Fitness Programs Used to Treat Eating Disorders? How Do You Treat Eating Disorders if Substance Abuse Is Also an Issue? Are There Support Groups for Those Recovering from an Eating Disorder? Each eating disorder impacts the heart differently, but all of them have a negative impact on the heart’s ability to function healthfully. A lack of nutrients necessary for optimum function, lack of calories required for energy, and undue wear and tear on the body in general from improper attempts to purge unwanted calories could all harm the heart. For example, anorexia can contribute to the development of heart palpitations, slowed heart rate, low blood pressure, and heart failure while bulimia can contribute to the development of a weakened heart muscle, low blood pressure and pulse rate, irregular heartbeat, and heart failure. Additionally, binge eating disorder can cause high blood pressure, high cholesterol, and heart disease. Osteoporosis is a disease in which the bones become less dense, more fragile, and more easily broken. When living with osteoporosis, people are more likely to break a bone, especially in the spine, hip, or wrist. Eating disorders can contribute to the development of osteoporosis due to a lack of calcium, vitamin D, and other nutrients that are necessary to help keep bones dense and strong. For example, osteoporosis as well as bone loss and fractures may be caused by anorexia. The kidneys may be negatively impacted by all disordered eating habits that cause a depletion of certain vitamins and nutrients, but certain behaviors that contribute to dehydration may specifically cause kidney problems. For example, anorexia may cause kidney stones and kidney failure due to dehydration and lack of nutrients, and patients living with bulimia who use laxatives and diuretics to purge calories may develop kidney stones as well, according to a study published in the American Journal of Kidney Diseases. Biology: Metabolism, hormone levels and shifts, and how the chemicals in the brain work ” these can be different from person to person and may contribute to the development of loss of control over eating during binge eating sessions in some clients. Genetics: In some cases, if others in the family similarly struggle with disordered eating habits, it may increase the likelihood that a binge eating disorder will develop. 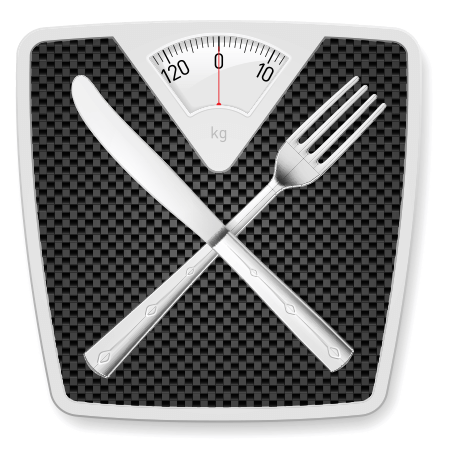 Dieting: Often a binge occurs after a period of severe food or calorie limitation. After deprivation, someone may be more inclined to eat an exceptionally high number of calories to overcompensate. Depression: According to a report published in the World Journal of Biological Psychiatry that analyzed 14 different studies on binge eating and depression, most studies that addressed both these subjects demonstrated an association between the two disorders. That is, people living with depression may be more likely to binge eat and those who are diagnosed with binge eating disorder may be more likely to struggle with depression as well. Coping mechanisms: The use of food as a tool to manage uncomfortable emotions or stressful situations can contribute to the development of a binge eating disorder. Yes. Though the majority of people who are living with disordered eating habits are women, a number of men also struggle with an eating disorder. In some cases, it may be an attempt to keep weight down for the purposes of competitive sports (e.g., “manorexiaâ€), and in other cases, it may be a struggle with binge eating or bulimia due to a poor body image and an ongoing struggle with maintaining a healthy weight. All the same issues that may contribute to a girl or woman engaging in disordered eating habits may also influence a male (e.g., depression, cultural pressure, familial pressure, low self-esteem, depression, and other issues). According to a study published in JAMA Pediatrics, an estimated one in three young males struggle with body image and at some point in their lives engage in one or more disordered eating habits as a result. In some cases, medication may be recommended. For example, if symptoms of depression are contributing to the eating disorder, antidepressants may be recommended. This will vary from patient to patient and may not be required for the long-term. Additionally, hospitalization may be required initially in order to stabilize the patient. Depending upon the nature of the client’s struggle with disordered eating, fitness programs may be implemented differently and with a different focus. For example, if someone struggles with over-exercising or attempts to purge calories ingested in a binge by exercising excessively, then the focus may be on gentle fitness that promotes heart health and emotional wellness over intensive calorie burn. On the other hand, if a client is struggling with obesity due to binge eating and does not regularly exercise at home, the focus of a fitness program in recovery may be on learning how to make a habit of safe exercise that is gentle on the joints and the heart as the person begins the process of getting to a healthy weight. It is not uncommon for a client to struggle with both an eating disorder and a substance abuse problem. In fact, the disorders often go hand in hand. For example, someone who struggles with anorexia or bulimia may attempt to curb appetite and limit caloric intake or boost metabolism by taking stimulant prescription drugs like Adderall or stimulant street drugs like crystal meth or cocaine. On the other hand, someone attempting to micromanage body fat may binge and purge or heavily limit caloric intake while also abusing performance-enhancing drugs like steroids. Unfortunately, the abuse of illicit substances will only exacerbate the medical issues caused by disordered eating habits and potentially add a full-blown drug or alcohol addiction into the mix. 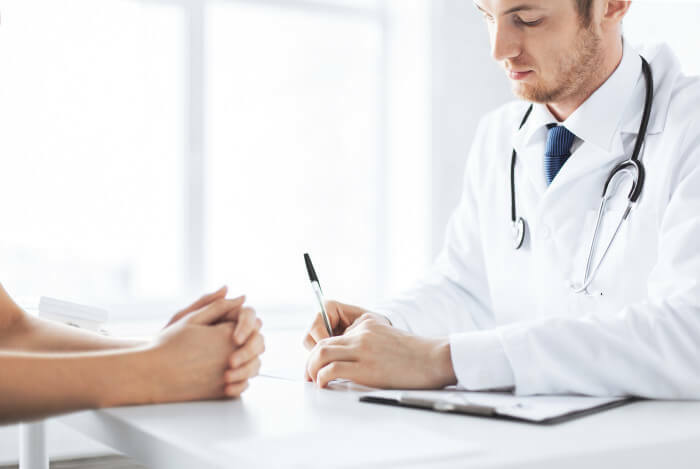 When this occurs, it is important that the client not only seeks immediate treatment but also that treatment is sought at a center that can comprehensively treat both issues simultaneously. Learning how to manage triggers for drug and alcohol abuse while also learning how to manage triggers for disordered eating behaviors can be accomplished at the same time, allowing clients to grow and progress on every level and leaving them better equipped to manage sobriety as well as a new and improved relationship with food and eating.